Aquatop Media Reactor MR-30 w/ Pump and all the necessary plumbing. 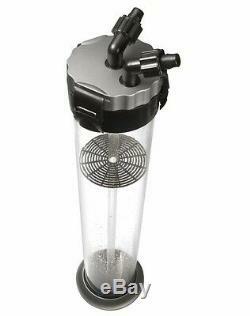 Aquatop MR-30 Media Reactor w/ Pump. Pump is not strong enough for biopellet application. Thank you for choosing AQUATOPs MR-30 Multimedia Reactor. This powerful reactor uses a reverse water flow design that prevents water from channeling through the filter media, thus maximizing the efficiency of filter media. 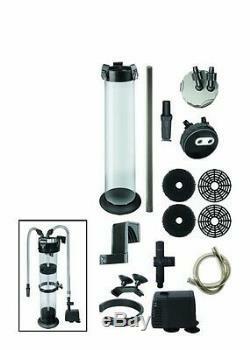 Constructed of high quality acrylic with an easy to remove lid, the MR Series can be installed either in-sump or hang on the tank and comes complete with all plumbing parts. 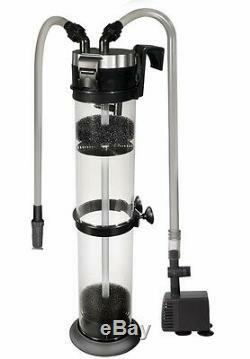 Filtration Capacity: 50-200 GallonsDimensions: 5.5" diameter / 23.5" height. Up-flow filtration maximizes filter media efficiency. Includes Aquatop's SWP-360 adjustable flow water pump and sediment discharge filter. Intake and output tubing included. Easy to remove lid with recessed o-ring. Ready to use with a pump and all the necessary plumbing. Product Dimensions: 6.5 x 5.5 x 23.5 inches. Communication is an important part in giving you an enjoyable encounter, and in making sure that all of your needs are taken care of. We understand that it is important for our customers to get what they ordered as fast and as hassle free as possible. We work with suppliers with high quality products to give you the best goods possible. It is important for us to give our customers an enjoyable experience, as we put our customers first. In the uncommon occurrence when a customers is not contented with the product they receive, we will do all that we can to fix the issue. If you have any inquiries, please let us know and we will fix it! We promise the best when shopping with us. The item "Aquatop Media Reactor MR-30 with Pump and all the necessary plumbing" is in sale since Friday, October 17, 2014. This item is in the category "Pet Supplies\Fish & Aquariums\Filters". The seller is "reefguy007" and is located in Tempe, Arizona. This item can be shipped to United States, Canada, United Kingdom, Denmark, Romania, Slovakia, Bulgaria, Czech republic, Finland, Hungary, Latvia, Lithuania, Malta, Estonia, Australia, Greece, Portugal, Cyprus, Slovenia, Japan, China, Sweden, South Korea, Indonesia, Taiwan, South africa, Thailand, Belgium, France, Hong Kong, Ireland, Netherlands, Poland, Spain, Italy, Germany, Austria, Bahamas, Israel, Mexico, New Zealand, Philippines, Singapore, Switzerland, Norway, Saudi arabia, Ukraine, United arab emirates, Qatar, Kuwait, Bahrain, Croatia, Malaysia, Brazil, Chile, Colombia, Costa rica, Dominican republic, Panama, Trinidad and tobago, Guatemala, El salvador, Honduras, Jamaica, Antigua and barbuda, Aruba, Dominica, Grenada, Saint kitts and nevis, Saint lucia, Barbados, Bangladesh, Bermuda, Brunei darussalam, Bolivia, Ecuador, Egypt, French guiana, Guadeloupe, Iceland, Jordan, Cambodia, Cayman islands, Sri lanka, Luxembourg, Maldives, Nicaragua, Peru, Pakistan, Paraguay, Viet nam, Uruguay.